We create simple wedding packages with you in mind, but can provide you the opportunity to work with our wedding co-ordinators and chefs to create a bespoke wedding service that suits your needs. We pride ourselves on a warm welcome, friendly advice and attention to detail – we are independent and individual. A reception drink to welcome your guests. Three course wedding breakfast served with tea, coffee and chocolate mints. Two glasses of wine during your meal. A glass of something sparkling to toast your marriage. A dedicated member of the management team to guide you through your day. Use of silver cake stand and cake knife. 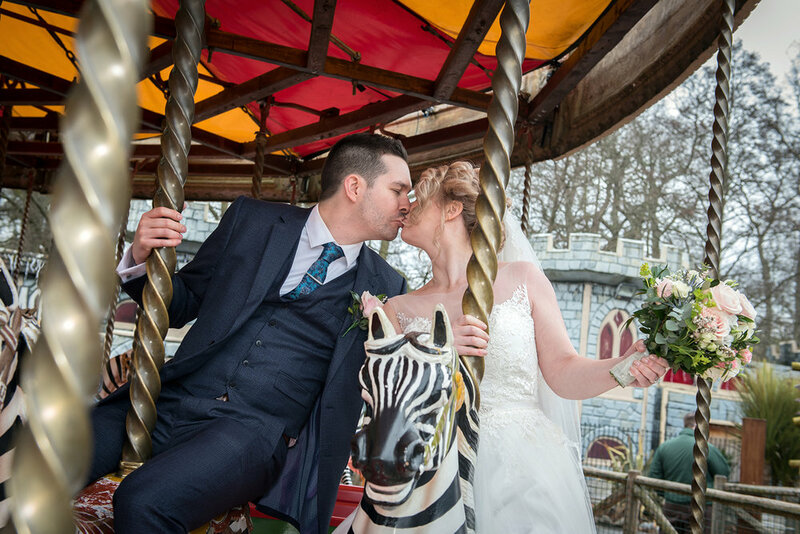 Unusual photo opportunity for the married couple to have a relaxed fun photo taken within West Midland Safari Park’s Theme Park. Upgrade from mints to petit fours. Turnaround tea & coffee station.